This young adult novel stars 11-year-old Nathaniel, who's apprenticed to an aging London magician named Arthur Underwood. The apprenticeship promises to end with a coveted position in Parliament, but it's turning out to be a lonely life for Nathaniel. Without family or playmates, the boy focuses only on learning magic and trying to please his master. This isn't easy because, as Nathaniel soon discovers, Arthur Underwood is a doddering old fool and a second-rate magician to boot. The old man confines Nathaniel to the library, refusing to teach him any real magic until he's of an appropriate age. Bored, the boy delves into advanced tomes, teaching himself the powerful spells and incantations his master forbids him to learn. When Arthur finally permits Nathaniel to mingle with other magicians, the boy is humiliated by a vain and powerful magician named Simon Lovelace. Arthur refuses to stick up for his apprentice, which stings Nathaniel badly. He vows that not only will he show all the magicians how skillful he is, but also that he will have his revenge on Simon Lovelace. With feverish intensity, Nathaniel studies his books and practices incantations until he knows enough to exact his revenge. He calls up a legendary djinn (a mid-level demon) named Bartimaeus, enslaves him with magic and makes him steal an ancient amulet from his enemy's collection. Nathaniel soon discovers that this artifact - The Amulet of Samarkand - has, in fact, been stolen from the British government. Its presence in Lovelace's home damns the magician, creating the perfect opportunity for Nathaniel to expose him as a thief. The boy is so hungry for revenge that he fails to see how much trouble he's really gotten himself into - angry imps stalk his every move; Bartimaeus plots his demise; and Lovelace threatens the Underwoods with violence if they don't return his property. Before he knows it, Nathaniel has lost the only home and family he has ever known. With a resentful Bartimaeus by his side, the boy takes on his arch enemy to avenge his family and save the magical world. All of his skills will be required to face the powerful magician and his servants from the Other World. Has Nathaniel taught himself well enough? Does he have the strength to face his enemies? Or will his pride destroy him for good? 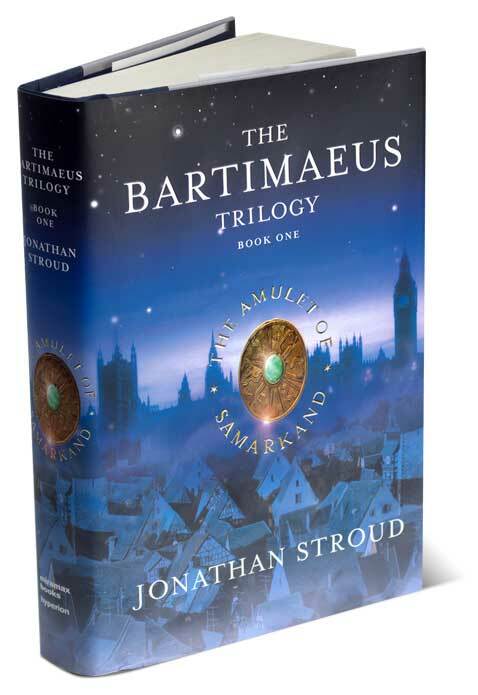 When I describe this book, it is from Nathaniel's point of view, but the story's real star is Bartimaeus. His voice sparkles in clear counterpoint to the boy's dull, whiney tone. I loved his character as well. The great Bartimaeus smarts at his imprisonment, knowing "[he] was bound to take some abuse for scurrying around on behalf of a scrap like [Nathaniel]" (10), so he fights back with sarcastic cajoling and mocking taunts. His exaggerated sense of self-importance made me laugh out loud. In spite of himself, Bartimaeus also finds compassion for the forlorn boy. These dueling natures make him a hilarious and intriguing narrator. Since he shines so brightly, it's obvious why Stroud named the trilogy after him. Lest you think the book lacks action, let me tell you, it has it in spades. Honestly, I couldn't read the story fast enough, so eager was I to find out what happened next. It's a charming, enthralling read that will cast a spell and pull you in deeper with every magical page. 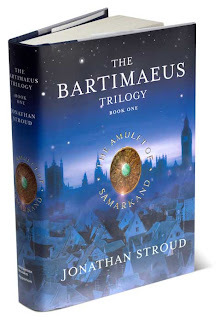 Note: The Amulet of Samarkand bears many similarities to Susanna Clarke's Jonathan Strange & Mr. Norrell, but not enough to get you out of reading the latter! Buck up - now you've got two magical books to read and enjoy. So glad you enjoyed this one. I picked it up last winter not knowing quite what to expect, and was thoroughly charmed. I thought the whole series was great. I love Bartimaeus. I love the footnotes. Everything about the series is just magical. Thanks for the review! I have often eyed this series and wondered if it was any good. It sounds like the type of book I love best. I'm finding the downside of reading all these book blogs is that they give me too many ideas of good books to read! I will have to become a hermit! I've seen this trilogy compared to Harry Potter, but I really didn't see that many similarities. I saw many more between this one and Jonathan Strange. They are very different books, but I just couldn't help comparing them. BTW: I think you were the one who recommended Stroud, Melissa. Thanks! I'm loving the series. I think I've got this one tucked away in my closet. I'm feeling a YA reading binge coming on after the holidays I think. Kay - I have been on a YA "binge" lately, and it's been great! There are just so many good ones out there. I enjoyed this one too but haven't got around to the two sequels yet. One of these days I'm going get around to Jonathan Strange myself as I really would like to read it. Is it a very difficult read? Oh-this one's in my library, and I've been trying to decide whether or not to pick it up.